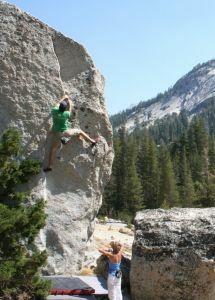 Directly across from East Tenaya Lake are a few great boulders with a variety of angles and grades. The powerful Roadside Cave, the old school classic Kamps Boulder and all the boulders around them offer up enough quality problems for a good session on friction slabs and knob pinches! Just east of the Kamps Boulder/Roadside Cave area and just west of Tenaya East is the Texas Radio Boulder with a few notorious highballs and the fun Lunge. Which SuperTopo guidebooks cover Tenaya West?